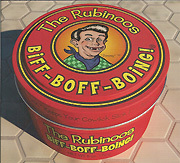 In just about every way imaginable, Biff-Boff-Boing! is about as good an introduction to the Rubinoos' brand of melodic pop as any of the group's records, but if we need to call it the Rubes' first all-ages release, then so be it. Come one, come all, ye of all ages and head spaces, and prepare to be rubally entertained. Ostensibly targeted to children with parents of stoutly good taste, Biff-Boff-Boing! is like a Pixar film that both children and adults can enjoy on different levels. For the kids, songs like Roger Miller's eternally singalongable "You Can't Roller Skate in a Buffalo Herd" and Tommy Dunbar originals like "Earth Number One" and "Have a Cow," the latter co-written with E.D. Chance, function primarily as cool-on-the-surface kids songs, but on another, Soupy Sales-y level, they're clever, funny tunes that adults can also enjoy with a wink and a nod. "Have a Cow," for example, posits, in a typically fun, catchy way, that telling Mommy to literally "have a cow" will mean milk will always be at the ready and more money will be in the bank. I mean, have you seen the price of milk lately? Have a cow, indeed! The acoustic, catchy toe-tapper "Earth Number One," a wonderful, catchy, kind of campfire singalong pop song, lead vocally helmed by Jon Rubin, whose voice just gets better and stronger with every new release, is a musical fan letter to everyone's favorite planet, and is stocked deep with nifty lines: "The martians are green with envy," "We are the world/That's got birds and bees and trees and rivers/We are the world/With dinosaur fossils and a pool of cream cheese," and even a childish, smutty joke capping off a listing of alternative planets: "Uranus/Don't go there!". Ostensibly targeted to children with parents of stoutly good taste, Biff-Boff-Boing! is like a Pixar film that both children and adults can enjoy on different levels. There is no end to the enjoyment that the Rubes deliver here, whether it's a reimagined-for-kids take on the Who's "Boris the Spider," sung with appropriate spooky Rubeness by keyboardist Susie Davis; a fun, might-as-well-be a cappella take on the great old doo-wop song "Babalu's Wedding Day," here recast as "Jimbo's Wedding Day" (and previously essayed by the Rubes as "Marty's Wedding Day" on Bomb Shelter); or the faithful version of the Archies' "Sugar Sugar," a song that was simply born to be essayed by the Rubinoos and was conspicuously absent from the group's covers album Crimes Against Music. A great showcase for the Rubinoos' classic pop harmonies (rounded out by the great Al Chan), Tommy Dunbar's always-sharp, hook-filled original songs, well-chosen covers, and an insanely infectious collective persona, Biff-Boff-Boing! is the latest, greatest Rubinoos release. Dunbar tells me that the day after he sent this album to me, he was going to Los Angeles to record the next Rubinoos album. Another one for the ages? You bet.